Coast Guard Bound for the South China Sea? The top U.S. Coast Guard official is eyeing a unique role for his fleet in maintaining peace and stability in the East and the South China seas under the incoming presidential administration. By mirroring the role of China’s Coast Guard in parts of the Asia-Pacific, said Coast Guard Commandant Admiral Paul Zukunft, the U.S. Coast Guard could be the face of U.S. military presence in disputed waters without appearing too threatening. The post has more background. This is a major change to Coast Guard tasking and there should be no doubt it will require some trade-off against existing tasking. In all probability our contribution will be a National Security Cutter. Keeping one in the Western Pacific probably means one less in the Eastern Pacific. Perhaps the Navy will compensate by putting a ship under SOUTHCOM. Thanks to Luke S. for bringing this to my attention. This entry was posted in Asia, China, South China Sea by Chuck Hill. Bookmark the permalink. Isn’t the coast guard supposed to guard your own coast? Stay at home. Guard America – God knows from whom, but at least you probably won’t end up provoking yet another war. The United States isn’t just the 50 states and DC, but also the Commonwealths and Territories in the Caribbean and South Pacific. Yet I see a Role for the US Coast Guard Auxiliary interpreter corp to help the USCG out with Language and cultural skills in the South China Sea and Asia. I think what he is trying to say is keep your Blue water navy designed and built for power projection off to the side and ready to go if needed. and use the Green water navy tasked with Maritime security to keep the peace. Imagine if this was taking place in the Caribbean. I look at this and I can’t stop comparing it to the Cuban Missile crisis. China has backed themselves into a corner and if we go too hard they will have nothing to loose and come out swinging. But at the same time we can not put up with economic piracy that china is committing. What is the plan of the USCG if China sends a fleet to poach in Alaskan waters? And do we have the resources to handle it. I can see the possibility of putting fisheries agents of one of the ASEAN coastal states on board and enforcing fisheries regulations in that state’s EEZ. I think one of the things that is wanted is a way to continue to demonstrate that the artificial islands aren’t territorial waters without sending a Burke that is going to generate headlines all over Asia. The LCS in Singapore will be one way of doing that, but I think they want to have white hulls do it in a way that is less confrontational at times. I think this is long overdue, I’ve felt for years that the pseudo war in the SCS is a new definition of war. Our competitors aren’t going to fight on our terms, it’s going to be a blend of propaganda, economic leverage, and varying degrees of physical force. How and what exactly we do with navy and coast guard ships in the region needs to be carefully thought out and part of a geopolitical strategy. 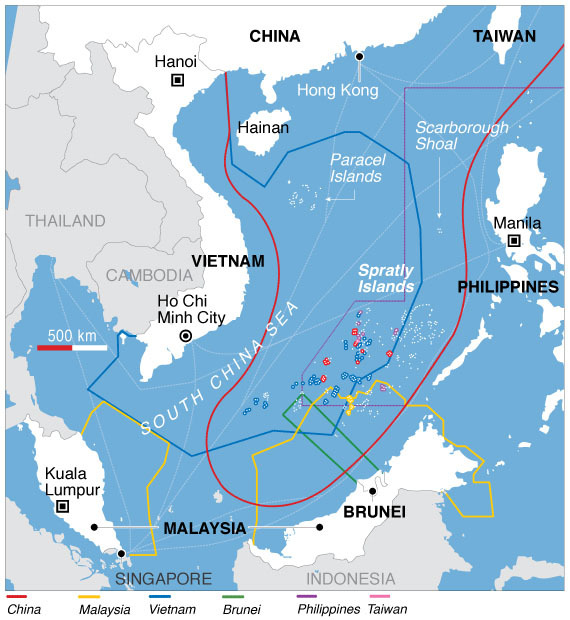 Just basing a few cutters in Asia accomplishes nothing unless we have a clear idea of what we are trying to accomplish. Unfortunately the TPP is now dead as far as the US, which in my opinion was a key part of what our strategy should have been. We will see how this plays out. Do you put some large Cutters on Guam for fishery enforcement and presence missions with SCS countries? That would make more sense to me than basing small cutters at a host country in the SCS and trying to police that nightmare. One thing is if you study trump and bannon, they are big shipbuilding proponents as part of a jobs growth strategy. And it looks like Forbes will get SecNav. For better or worse shipbuilding budgets in the navy and coast guard are about to balloon. We don’t have large cutters in Guam but I think in the near future, we might as well put an OPC or NSC in Guam. I think use of the CG is part of a plan to “semi-deescalate”. What I mean is that currently, the Chinese CG…which is pretty heavily armed…has been used as a tool of intimidation. If we send USN ships the optics would look bad as we are meeting the “purely defensive Law Enforcing” Chinese CG with “warships” Nevermind that some are more heavily armed than the current LCS. But White hull on White hull makes it seem less provocative while still standing up to the People’s Republic. And they will of course merely be “assisting” the CG of the other nations in the dispute. I’m not saying that this is a good idea or a bad one, just why I believe we are doing it.. There was a time that piece of water was another of the Royal Navy’s private boating lakes. How things have changed.